Google Summer of Code students are delivering solid work. Using editable rich text (e.g. 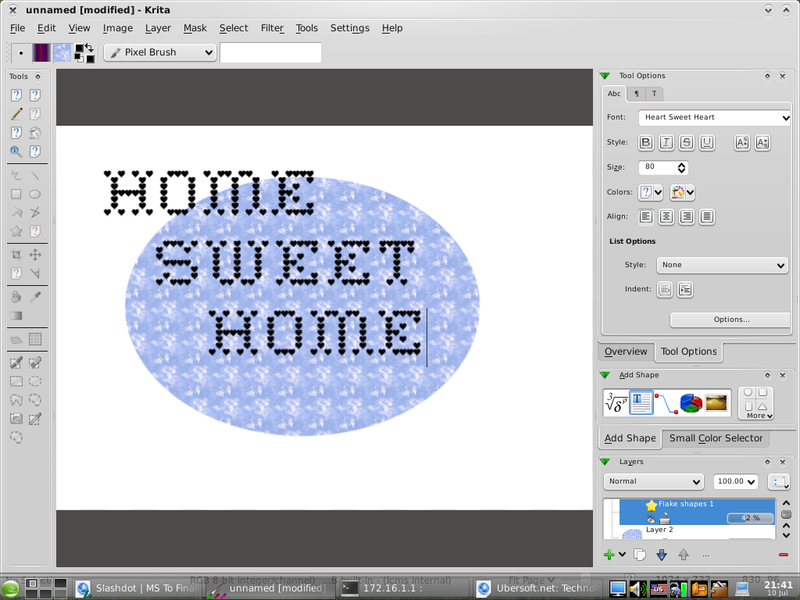 in Krita) is now possible. a range of sheets or a selection of cells. of changing the paragraph layout. guides and dragging of guides for all flake shape objects. New for text: visually alter your paragraph spacing. The more I look at Koffice 2.0, the more I like it. Congratulations and thanks to all developers, sponsored, students and sponsors. I Always loved koffice, but these alpha look very promising. Yes, and a hand-full of developers will never really be a replacement for hundreds or thousands of developers. Yet, it is astonishing to see what KOffice devs achieve, and what they do to reinvent office suite interfaces. Well it can't really be a replacement for MS Office because numerous (thousands?) third-party extensions (with Macros and VB-scripts and whatever else) exist for MS Office which try to blow MS Office up to a full ERP-app, a report generator or whatever else. We simply can't supply a plug-in replacement for MS Office with regard to these "macro-apps". Possibly it's not even needed as the big flood of MS Office extensions seems to be over anyway (with 75% of the old macros becoming now defunct on new MS Office releases and no one is taking the burdon to port old VB-Macros...most of them are ugly hacks anyway). As most of the old MS Office Macros got used inhouse at e.g. administration offices and are going to be replaced with cleaner intranet-solutions over time the focus is shifting away from one office-suite-that-wants-to-be-everything to more lightweight solutions. KOffice might come in handy than ;-).. At least for me, it would be the ideal solution. Which ODF version is targeted for KOffice 2.0? Is it 1.1 (OOo 2.x) or is KOffice alreading heading for ODF 1.2 (OOo 3)? 1.2. Actually, we're driving some of the innovations there. Yes, especially since 1.2 brings many improvements on clarity of the spec for better interoperrability. That said, all of ODF 1.2 (or 1.1) won't be covered by KOffice, since only of the subset of the features are supported. Do you mean KOffice 2.0 by that? I wonder why one should not aim to support the spec totally. Part of it is a 2.0 thing -- text tables, for instance, are unlikely to be in 2.0. Part of it is a platform thing: OLE objects, DDE or embedded Java applets are unlikely to ever get in. And part of it is the sheer task of implementing the references standards, like SMIL. You are doing a great job. Thank you so much. It is so very important that we have a contender that can match with open office. Is there going to be a 'Save as (.doc, .xls, ...)' option? If KOffice allows saving as MS Office formats, it will accelerate its use in office environments where OO.o is being used today. KWord already has a save as .doc option. Of course, what it does is save in the rtf format, but that's okay -- Microsoft seems to do the same when word saves for a different word version. As for KSpread and compatibility with the excel file format, probably not, unless someone steps up and starts coding. I'm really looking forward to Koffice2. Congrats to the many talented developers on their progress. And, thanks! So, is it going to be use more than Koffice 1.x ? I've on ocasion used Kword 1.x mainly to print images and acompagnied text with it. It was not the purpose but it dit it well. The rest og the software in Koffice was totally a wast of time and embarissing quality wise. The should not have been anything else than Kword. How are things now? I've tryed at couple of alfa/betas or whatever - last time about 6 months ago - and the same as with 1.x series. Kword was more or less usable - the rest of the apps mainly crap. Could the "leadership" plese dump most apps and concentate on Kword? At least do the one important app well; in stead of having 10 halv baked apps its better to have one well done. Re: So, is it going to be use more than Koffice 1.x ? I'm assuming you are only half-informed about the status of Koffice apps. I for one would say Krita is a lovely comprehensive app. 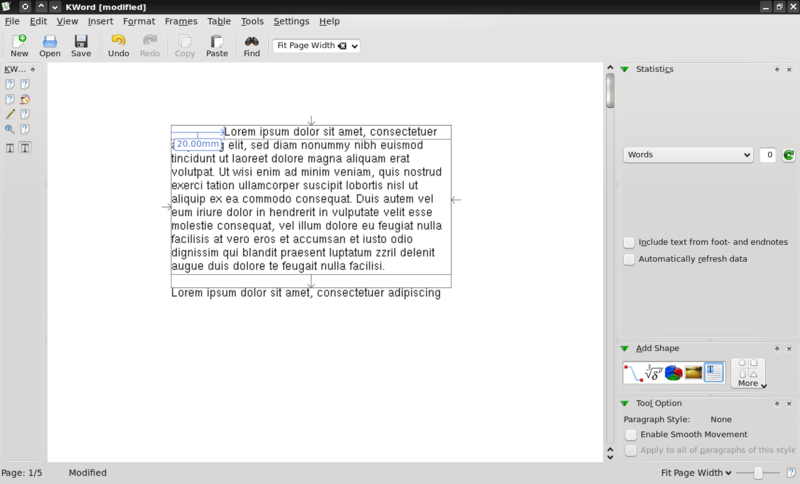 Kpresenter is also really nice and Kexi is showing a lot of promise. Kspread may not be in an ideal state and kword surely lacks behind atm (but is shaping up pretty nicely). I strongly encourage you to dig a bit deeper before posting in a diffuse way. In fact it's a far way from 1.x to Koffice 2, so many things have changed under the hood. And btw.... I think, there is no "leaderhip" - whatever you might have in mind; there is no such thing I assume. You know, that's the beautiful thing about having choices. You are free to use what works for you. It's obvious from your post that KOffice doesn't work for you. So be it. By all means don't use it, because calling other people's work crap (and a waste of time as well) accomplishes nothing. On second thought, it does make you seem like an ungrateful brat. I for one am pulling for KOffice. I will try to use it when 2.0 is released. If it works for me, great. If not, I will use something else. Even then though, I will continue to support and encourage the developers. And as soon as it works for me I will use it full time. Keep up the good work KOffice team. KOffice 2.0 has undergone some major refactorings, so in final 2.0 release, it might not have all intended features and still have tons of bugs (or if you prefer to call it... crap?). But the most important thing is, the framework is now ready to take us to the future (2.1 and beyond), so that it will be easier to add further cool new features. I guess you have to do more homework to know what are the cool new technologies behind KOffice ;-). What's the status of the collaboration feature (listed as "Nice to Have" on the roadmap) with regard to KOffice 2.0? Re: Simultaneous collaboration, like Abiword? It still would be nice to have :-). At last year's summer of code, we had a student interested in implementing it, but he never produced any code. And right now, everyone is pulling to get KOffice release-ready, so it's extremely unlikely this feature will be in 2.0. Exelent work guys! You are doing such great office tool for normal user. It might not beat the Microsoft Office because for it has great amount of plugins / scripts etc... but for normal user, student and writer, Koffice is already enough. We need to go step by step until we can get bigger user base from windows / Mac OS X side too. First we need to get 2.0 and then 2.1 (you know it ;-)) when more people starts to use it, it will get attension what it reserves and get more coders! Ah, forgot to ask, is there coming fix for the "kword" panel on left side? Yes, a preliminary fix for that is already in alpha9. preliminary fix? I fixed all those issues in SVN and got nobody bringing up any issues. One feature of OpenOffice i really like, is the ability to open another document type e.g. spreadsheet, from Writer and visa versa. Does 2.0 allow you to do this, if not, are there any plans to do so? What theme is being used in Krita? It looks much better and more usable than my default Oxygen. Is is an update of Oxygen or a modification? Nope -- just bog-standard KDE 4.1rc1 Oxygen. I did make the fonts smaller and tweaked the colors and contrast a little. I still it's a pity I cannot make the scrollbars emerald green anymore -- but all in all, I like Oxygen very, very much.